Another year, another onslaught of celebrity Instagram posts featuring Thanksgiving centerpieces that cost more than my monthly rent. Last year, The Stars wore capes, gave thanks, bought sweaters, exercised, cooked, and blessed us with photos of baby Luna Legend. This year, they did some other stuff. Let’s dig in! Reese Witherspoon advertised a dress. Kourtney Kardashian and Scott Disick had a sleepover. Madonna took the fam to Malawi. Chrissy Teigen burned a pie. Tiffany Haddish fled the country. 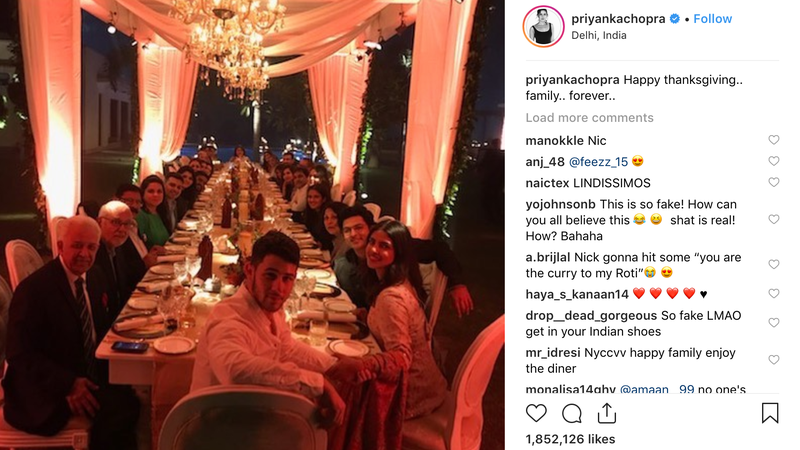 Priyanka Chopra and Nick Jonas had a feast. I am not entirely sure what Lindsay Lohan is doing here, but. The Biebers went to the woods and thanked Jesus. Katy Perry wore a snazzy hat to dinner. Zac Efron risked a cramp. Gabrielle Union held her baby. Happy Black Friday from me, the Celebrities, Chrissy Teigen’s burned pie, Gabrielle Union’s baby, and, most importantly, from Naomi Campbell.